The Nittany Valley Sports Centre is proud to be the area’s exclusive provider of the Parisi Speed School. The Parisi Sports Training System offers proven results for athletes of all ages from beginner to professional. Below you’ll find programming that is available for teams and individuals. Parisi Elite Sports Performance transitions Total Performance athletes to their next level of ability. 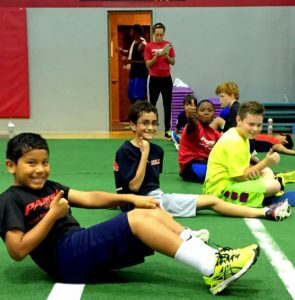 This program focuses on the regression and progression of our signature speed-training methods. At this level, certified Parisi Performance Coaches use their knowledge and experience to individualize strength training for their athletes based on their abilities and specific goals. Utilizing either Basic Strength or Advanced Strength programming, this program builds on an athlete’s physical foundation and develops their athletic abilities even further, in order for them to maximize their potential and reach their goals on game day. This program refines athletes’ skills to maximize strength, aerobic capacity and sport performance. Athlete’s in this program will elevate their game to the next level under the expert guidance of Certified Parisi Performance Coaches. Adult circuit training where every class is a unique experiencewhich combines weight training, body weight exercises and cardiorespiratory movements to help you get strong and lean. This is not the “Ground Hog Day” of group fitness. Every class is a unique experience. Come listen to some fantastic Rock Music while getting healthy and fit. Classes will combine weight training, body weight exercises and cardiorespiratory movements to help you get strong and lean. This class is for anyone that wants a fun, exciting change to the boring old gym routine. Our certified personal trainers will guide and motivate you through your workout in our bright, energetic 4,000 square foot Parisi Speed School Gym Space! Email parisi@thecentrepa.com for more information or to schedule your personal Parisi evaluation. Registration for any Parisi Program will occur with the aid of a Parisi coach, after the evaluation has been completed. *$25 athletic evaluation required for all Parisi programming at the Centre. $25 fee will be credited toward purchase of any Parisi package selected. NO CONTRACTS! $24 one-time, annual player fee required for all scheduled programming in The Centre.